Maximum performance in selective soldering at minimum cost: this is the GoSelective and SelectiveLine from SEHO. The GoSelective and SelectiveLine offer an uncompromisingly high soldering quality. Featuring a high-precision miniwave process, the GoSelective and SelectiveLine are ideally suited for high product mix offering maximum flexibility particularly for small- and medium-sized production volumes. The systems feature a precise axis system for exact positioning of various workstations and they are capable to handle both bare boards or assemblies in carriers up to 500 x 500 mm. Of course the GoSelective and SelectiveLine are fully lead-free capable. 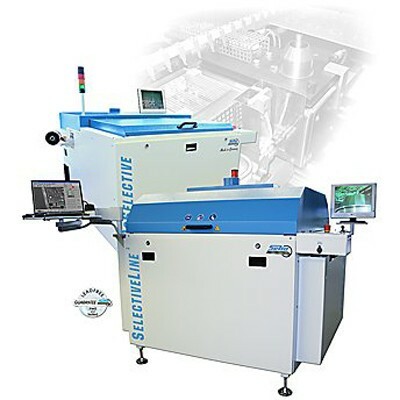 For highest process reliability the GoSelective and SelectiveLine are featured with a fiducial recognition function for automatic PCB alignment, process visualization, a comfortable, easy to use offline teach program and many other features. The SelectiveLine machine concept is designed for inline operation and may be upgraded individually to reduce cycle times remarkably if production volumes should increase. This also makes it possible to adapt the degree of automation in the production to current requirements. The SelectiveLine concept covers three basic modules: the SelectiveLine soldering module, a separate fluxing module and a preheat module. These modules may be arranged individually or as a complete production line. All modules are controlled through one central SPC control unit which is featured with a powerful CAN bus system. In addition, the SelectiveLine may be equipped with SEHO's award winning real-time and real-quantity control of the drop jet fluxer. This unique fluxer control not only monitors the function of the fluxer nozzle but also measures the actual flux quantity of each drop jetted by the drop jet nozzle during the fluxing process. The measured quantity is compared to a reference value. If the system detects a deviation, an error message will be initiated. Additionally, system software clearly indicates which part of the PCB has not been fluxed correctly. Thus, the real time / real-quantity fluxer control ensures the highest process reliability and constant process conditions without influencing the cycle time. With the high-grade and compact machine concept “Made in Germany” the GoSelective and SelectiveLine ensure absolutely reproducible soldering results at a small footprint and thus offer an economic alternative to traditional hand soldering processes.